Who can forget the classic tussles of the late 70s and early 80s between the powerful Empire Athletic and plucky underdogs Republic FC? It may seem a long time ago now – far, far away in the minds of many – but those days will always live on in my mind, especially because of the masterpiece that was the Empire Athletic kit of the era. 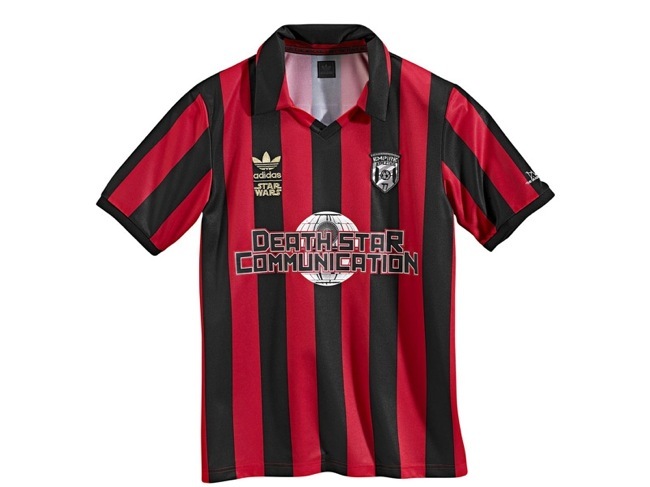 The menacing red-and-black stripes of the Empire looked as sharp as ever, even with the sponsor’s logo of Death Star Communication, a project which had its detractors (especially after the collapse of the original company in 1977), but was in a period of exciting rebuilding that echoed Empire’s team at the time. The previous few years had been tough not only for Empire, but also for the Ultras (aka the ‘Dark Siders’) who followed their team around the galaxy. After many long years of dominance, Empire’s claim as being the supreme power in the galaxy was under threat from the one-time minnows from Alderaan, Republic FC. The Rebels, as they were affectionately known, had invested in youth and were lucky enough to capture the talents of one Luke Skywalker, despite serious interest from Empire. Coupled together with the experience of their captain marvel, Han Solo, the Rebels formed a great alliance and put an end to the supremacy of the Dark Side by defeating them in the 1977 Intergalactic Cup. For the following three years, the Rebels remained in the ascendency and Empire’s power waned. There were fears amongst the legions of Dark Siders that their team would never recover after the heavy defeats of the preceding few years. However, around the turn of the decade, things started to pick up for Athletic. Having unearthed a gem in Boba Fett, fortunes began to change for the Dark Side. Republic FC lost their inspirational captain due to injury, while their boy wonder Skywalker seemed to be going through a transitional phase in his career, which had a negative impact on his form. All of this culminated with the stunning return to form of the great one himself, Darth Vader. Several years of Rebel superiority looked to have taken its toll on the Sith Lord. He had felt to blame for many of Empire’s defeats but he often took his anger out on his own team-mates, much like his natural heir, Roy Keane. However, he managed to get past this and his sparkling form in the 1980 season led Empire to the title, with memorable displays against the Rebels at their new home on Hoth and the Empire’s temporary home in Cloud City, where he completely outplayed Skywalker. It was all done in what came to be my favourite kit. 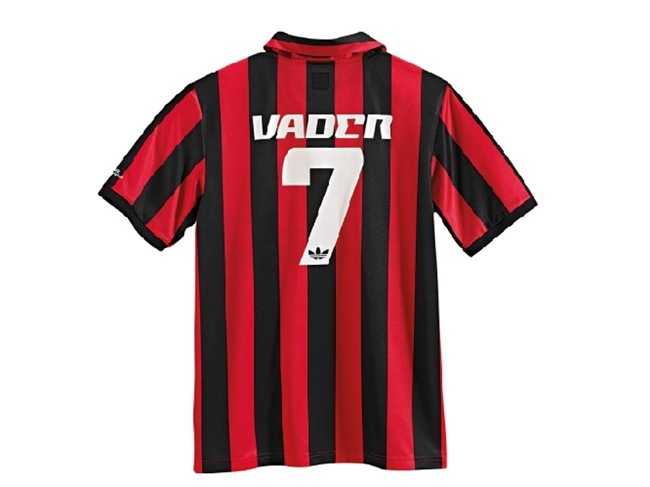 Obviously I had to get that shirt, with Vader No.7 on the back, and I still wear it to this day. It holds a special place in my heart and I thank Adidas for making such a great kit. Of course it all came crashing down a few years later with the return of the Jedi, but thanks to this great kit, I’ll never forget the days when the Empire truly did strike back. If you have an all-time favourite kit and would like to contribute to this series, please let us know by emailing ollie@anorak.co.uk. Meh, looks like a shite rip off of a Milan kit. 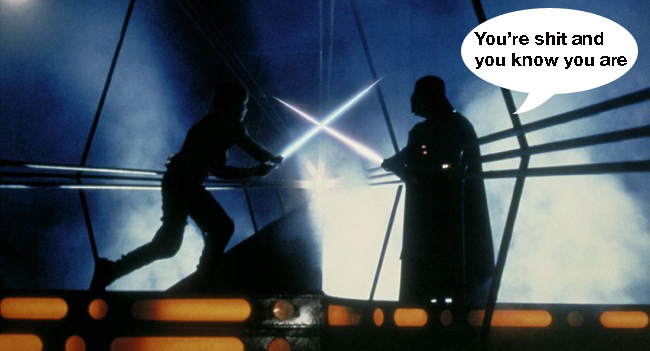 The whole Star Wars joke thing is also extremely lame. It is a joke? No wai! Looks familiar to Milan? What about the other teams, which colors are black, and red? Liked the article, like the shirt. I’m so getting this one. Combining The Force and Football? A risky move indeed. Well played, young Simmons.